Welcome to MTV, Bob Dylan! With your Miami Vice jacket and t-shirt combination you should fit right in! Music videos had had a long history before MTV was launched in August 1981, but Bob Dylan avoided them until 1984. 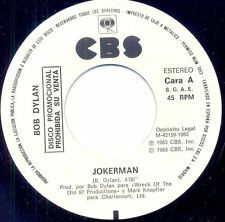 With the release of “Jokerman” as a single from Infidels, Dylan produced his first (or second – depending on what was up with that weird footage of “Someone’s Got a Hold of My Heart”). It is, by today’s standards, a very strange relic. I will admit, at first I had trouble finding this video. I kept seeing it on YouTube and elsewhere and I actually assumed that this was a fan-made video, or what on YouTube tend to get called “lyrics videos”, in which a fan uses iMovie to type the lyrics of a song onto a bunch of photos culled from Google Images. That is precisely what this video looks like at the start, and then, at the chorus, we get Dylan badly lip-syncing. Even a couple of minutes into it I wasn’t certain that this was the actual video (I did recall the Miami Vice jacket, but not the rest). Rebecca assured me that this was exactly how bad this video was thirty years ago. For the most part, it is a collection of still images of classical statues and modernist paintings, with some low-grade animation thrown in. That animation, straight out of Monty Python, looks less sophisticated than the stuff my eight year old can do on an iPhone app now, but that’s a product of the times. The Ken Burns effect on the still images is annoying too. The most interesting thing about the video is the selection of images, including a series of photos of Dylan aging from his twenties to his forties as he sings “Shedding off one more layer of skin”. The video sort of self-consciously plays him as a grand old man who’s no longer totally with it by reminding us of “better” versions of Bob from the past. Otherwise it has some odd moments, probably the strangest of which is the inclusion of a photo of Hitler (“you’re a dream twister”, that’s a little on the nose) and one of Ronald Reagan with his fingers in his ears (from the White House News Photographers Dinner in May 1983). The subtle indictment of Reagan here may play havoc with my charge that he’s a Reagan Democrat, though I suppose it’s simple enough to share someone’s politics while discounting the man himself. All in all, this is a pretty terrible video. That it can be so easily confused for a fan made video probably says a lot about the evolution of this art form over time. I will say, this video made my entry into Dylan fandom highly problematic. This was probably right around the time that I began listening to Dylan – his first new album that I bought was Empire Burlesque in 1985, and I think I was probably listening to some of the older material at this point. I remember watching this video on the music video shows on CITY-TV (J.D. Roberts!) after school and thinking “this is so unbelievably lame”. Worse, when I did start telling people about Dylan they would immediately start singing “whoa oh oh oh oh oh oh, Jooookerman!” and then laughing uncontrollably. It’s hard to defend someone as a rock icon when something like this is in rotation. Not that it was every much of a hit. As for the song itself, I’ve come to quite like it. Not necessarily the album version, but even that isn’t too bad. Interestingly, it has become the favourite Dylan song of my son, who proclaimed it thus this week. He loves the chorus, and it is one of the few Dylan songs that he asks after. The phrase “Jokerman dance to the nightingale tune / Bird fly high by the light of the moon” is, in his opinion, Dylan’s best couplet. I agree, that is quite good. The “oh ohs”, though, sound a lot better one on of the unused outtakes. Oh well.